Gamification is the idea of applying game mechanics and techniques within a non-game setting in order to engage people within the subject matter to achieve a goal. An example of this is using gamification within education to gives students a fun way to learn a new subject in order to achieve better grades and a better understanding of the subject through the use of game mechanics such as points and achievements. Although the term gamification was coined in 2003, it is something that has been around since 1896 and is still growing today. An early example of gamification to date is the use within the frequent flyer programs (FFP) which rewarded customers for reusing their airlines and traveling with them, the amount of points given would vary on the amount the customer would use the card and dependant on the distance that they travelled. Other benefits of using the card was to use it for other goods and services the company provided such as travel upgrades. Here is an infographic I had found which shows the history of gamification, I thought it would be best to just use this example as it is thorough and most the points I would have made and more in a more concise and artistic way. The research company Gartner predicts that by 2015, a gamified service for consumer goods marketing and customer retention will become as important as Facebook, eBay, or Amazon, and more than 70% of Global 2000 organizations will have at least one gamified application. Looking at this quote, I feel as if many of our current services offer various gamified elements for example shopping at Tesco has become gamified with the thrill of going into the store, selecting items over £1 because you know that £1 is 1 point on your loyalty card. Then you wait at home for a letter in the post telling you how many points you have earned and you feel as if you have made an achievement and gained a reward for completing your ‘quest’. Another example of gamification in the modern world is the use of advertising on energy drink cans. I have purchased a can of Monster and it said that if I use the code on the tag on the can I could have a chance to unlock additional content within Call of duty for the Xbox 360. This mean that by making the purchase, I had a chance of unlocking additional content. This really made me as a player engage because I like to play games which involve chance and purchasing that can was just like purchasing a lottery ticket although I had a chance to win something within the game. Gamification is becoming such a large part in our lives to help us learn better, experience more and engage with the parts of our lives that we may consider boring or difficult. Gamification allows us to add elements to get others engaged with what we are aiming for, this is why it works effectively within business and it gets everyone playing and working effectively for the same goal. This week was our one to one with tutors and after a conversation with Paul we managed to highlight a few areas that have been possibly overlooked or just not considered enough. I have made the decision to go back to basics and address the importance of good visual decision making. This statement only backs up the importance of making the correct visual decisions otherwise it will affect the users perception of your work, either it be a website or a game. This does not mean that visuals should come before making work function, but visuals should enhance what functionality your product has because there’s lots of evidence that beauty enhances usability. I thought I would address this matter by looking at how people critique art as the process would be the same as when choosing out designs, creating sketches and helping in my development of a project. How good is the technique? Is the style suited for the target audience e.g. Cel shading, Realistic? In art there is a lot of experimentation in which the results do not achieve the goals desired for example Leonardo da Vinci’s “Last Supper” used an experimental technique when mixing the pigment and plaster and because of this the artwork began decomposing. It takes a lot of practise for the skill to meet what your dream results but as you grow so will your art so that you will be able to achieve the results you want with study and practice. I feel technical skill when designing games is important as we follow a design process and each stage of this has to be correctly applied meeting with good skill in order to produce effective results. This is why we should not ignore drawing or other important parts of the process but challenge it and in time the end result will be worth it. Reflecting over my work, I have felt like my technical skill is still in need of development but I know this, and I feel that with every passing year this is continuing to improve. I do not feel as if I compromise as often anymore, although sometimes it is present I try my best to apply the skill and expand on what I know to avoid this in the future. An example of this is my work within UE4, I feel as if Blueprints has been a struggle for me although I did pick up some skills within it, it is not where I would like it to be. I have intensions of tackling this issue during summer so that when addressed with the dilemma again I will be able to tackle it with less issues. Composition is when we look at how elements interact with each other. For example does the colour, shape and texture work together or do we need to make changes for it to do so. Did the artist just throw this together or did he do his research and made educated changes? Does the result appear awkward, if so, why? We have to remember that not everything is perfect and as humans we notice these things but fail to notice why or if it had been done intentionally. I feel composition can be researched and applied effectively, and no matter the result of this as long as you have points to back up your decisions rather than making uneducated choices then your work will have its own stability. In games design, we must make decisions on things in things such as the development stages of our projects and if we cannot get the composition right then there is little point in developing this into a final product otherwise it will fall through for many reasons, for example it may not meet the target audiences needs or fit the brief completely as you are compromising decision making. In reflection to my composition, I feel this is the thing that I have compromised the most as I feel I have researched only generally and have not considered things such as if the colours are working correctly or if I am using the correct text and images for my project. A clear example of this has been within my ongoing gamification project. Yes, I did research into this in regards as the app itself and its target audience but I did a fragment of research in regards to the visual side of it and because of this it has made the app look visually poor. Due to this being a project I have intension of completing over summer I have every intension of approaching the issue and having a complete do over in regards to the visual side of things and consider things such as correct fonts, effective colour pallets and a better interface. With all these together, plus the recent adaptions to the project such as having it appear more realistic by having an animated hand using the app. I feel as if it will bring the gamification project to its peak and will be able to distinguish itself as an application rather than an animation. In art it is important that we have a feel for the message that the artist is trying to convey to us as the audience. It is important that we can see how well the artist transfers this message to us and how effective they have been at doing so. For example if we were looking at biblical art showing Hell then we would expect harsh colours as Hell is portrayed as the worst place to be. We would expect Heaven to be perfect with light colours and perfect in every way possible. As a game designer we would also want to convey a particular message to our audience, this could be about the pains of war to things such as the struggle of managing our own farms. Game designers have the opportunity to show games in fully immersive 3d and even more so with equipment such as the Oculus rift now readily becoming available we can show our content in a more dynamic environment. In comparison to other media, we have more ways to express ourselves than ever before and to not use this as a way to bring home our message to the audience would be one of the worst decisions that we could make. When considering my project work, I feel as if this is something that I have managed to do rather well as I have always made sure that the application meets the requirements of its audience and thus being portrayed in the correct way. I have tried to make my projects engaging although I do know improvements can and will be made in the near future I am satisfied with how I have dealt with the content side of things. Although, I do feel like my considerations with the composition may have affected my content side of things, I do feel as if my overall message or idea of my projects have managed to come through. For this blog post I will discuss how I now go about creating materials for all of my projects. The software I use within my process include Photoshop, Marmoset Toolbag and Quixel suite. 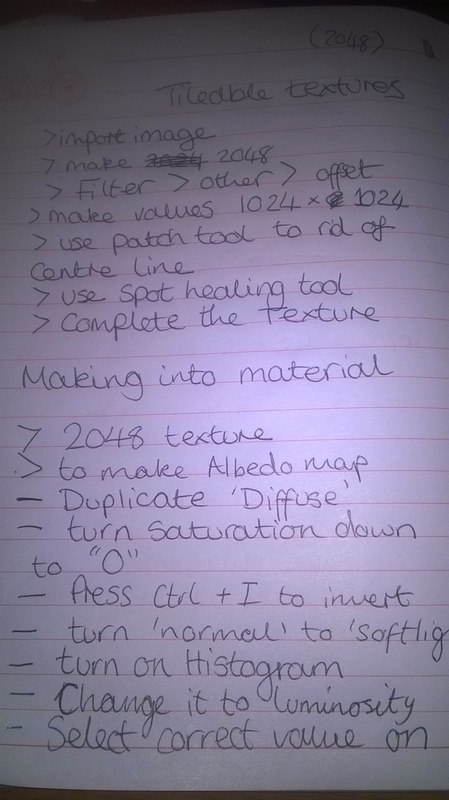 Using these different bits of kit will allow me to create a tileable texture which I can generate a normal map, a roughness map and an albedo map. 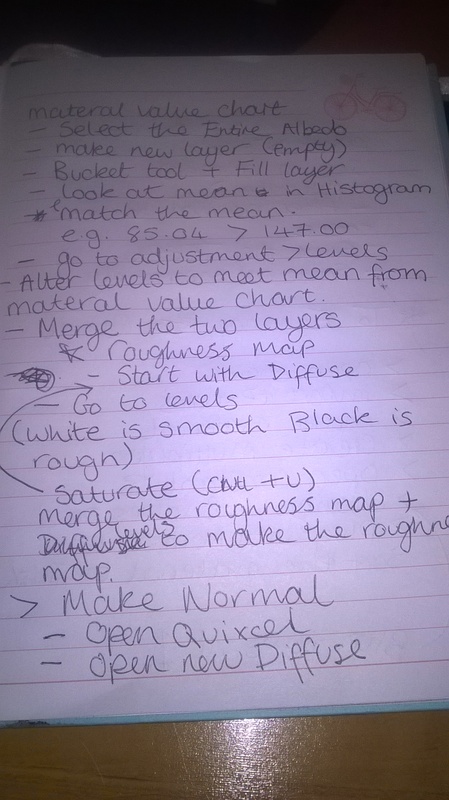 These are the instructions I follow which I have written into my notebook, following these steps and you will be able to create your maps the same way I have. 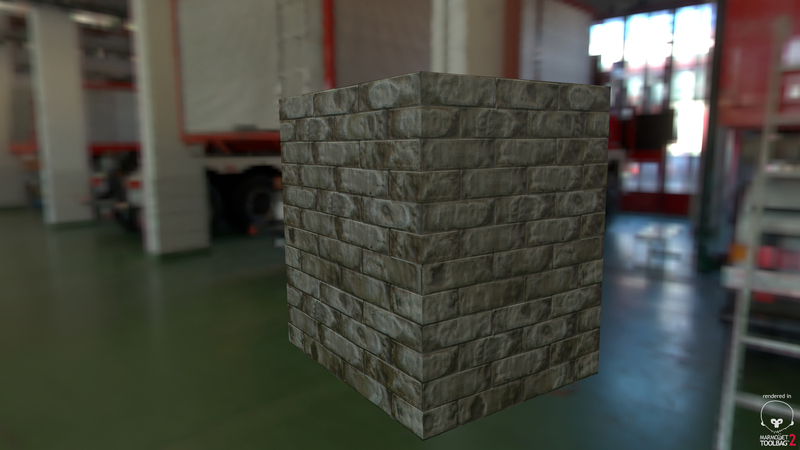 I have also included how you can enhance your normal maps that little bit more within engine. Here are two examples of materials I have made. One is with an albedo map, roughness map and a normal map. 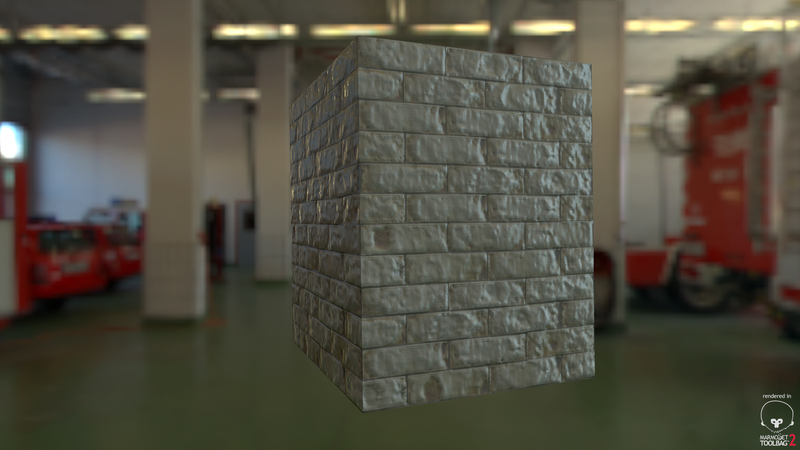 The other is with the diffuse, roughness map and normal map. The video I will be posting notes about is displayed within my blog post so please check it out so then my notes will make sense. I have taken notes about the video and simplified it, but also wrote my own answers to the questions within the video if they were asked to me. These opinions were based of my own thoughts but also the response of others within the video. What are the benefits to design a system rather than using an engine? * I personally feel that designing your own system would be better than jumping into an existing engine because although with other engines they are more developed, they may not meet the needs of your game so you would have to manipulate your game to suit what is available. By creating your own system/engine, this means that you can tailor to suit your games needs. What about hacking games that exist vs creating your own? At what point should this be a new game? This could live within the existing framework. How much do you rely on what’s already out there? How much are you bringing to the table? Advancing what is already available, allowing innovation and watching the evolution of what games could be by improving and stretching what’s available that little bit further. * I feel like it honestly depends on how much of yourself you project into the game, and what steps you take to alter it. End of the day, adding your own flavor to a game can really change the player experience which would make it a new game completely. Say you’ve got the idea for creating a design for your game, you have bits and pieces of what you want in your mind, the mechanic ideas kind of there, how do you break it down so you can flesh it out and not have the big picture overwhelm? *Currently if I want to start fleshing things out, I would write down the essentials of what I want the game to have and from their I am able to expand into more detail and work the game around what those core values. 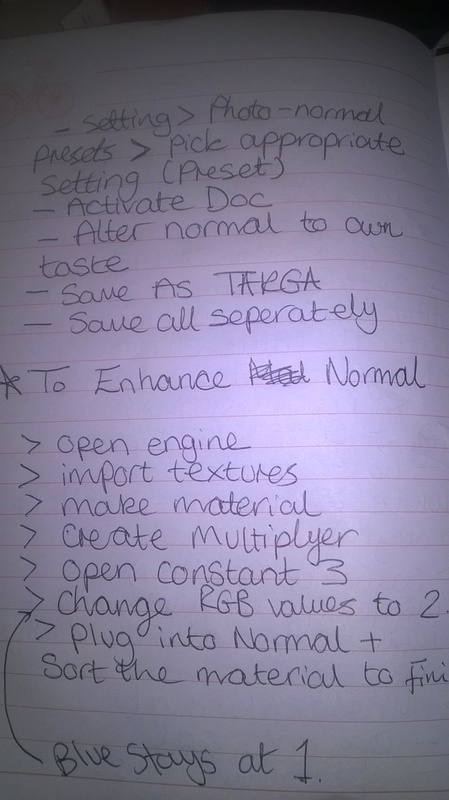 I would usually start with a key phrase to help explain what my game is and from there jot down what I need to include. Mechanics will help create a particular experience in the game play, and to decide on what kind of experience should be then using the theme would help influence that. *I have always worked with theme first because I feel that the theme would play a big part in deciding which mechanics I would choose to use. Where do I draw inspiration on? *I usually draw inspiration on things that I have recently seen within the media or things I know I enjoy. I have never really thought about looking at things I dislike and I feel in the future this will benefit me to look at as it will expand my research and thus giving me a better quality product. Getting inspiration from other games, what do you consider the greatest challenge for you to translate a board or game mechanic when you translate it into a RPG system? Don’t leave too much unknown – have some control to lead the players through to the next point. * I feel as if the biggest challenge would be to keep a player in a state of flow with the game and to aid that player so they can go from point A to B so that everyone can be on the same page but without limiting the RPG experience. Do you find gaming licenses restrictive? Have you ever worked with a gaming licence? If so has the licences restrictive nature caused you to look elsewhere for a mechanical framework to apply your theme too? Is there a good check question that you can keep asking yourself to make sure your design process is on track? Should that question change in different stages of the games development? When my player reads this will they be able to do it? Why am I designing this game? What experience do I want the player to walk away with? Is it fun, Entertaining or engaging? I know what I mean but do they know what I mean? Are people using this role? Is it coming up in play? If not, is it useful? What is happening when mechanic are being used? Are they having the effects I wanted? *Am I making this overcomplicated and will the player be able to understand what I want them to do? How much would you keep a theme general or more recognisable so that people can easily get it vs designing a more in-depth world with its own quirks? If going indie, start specific. Don’t make games for the masses, make games for yourself. Working your way outwards. *As noted within the video, I would start with a general idea and build into that as it allows you flexibility while not letting you stray too far. This is just how I have always worked and for me I find it the best way to plan my ideas although I do see the benefits of designing a more quirky in depth world as you can create something simple and for it to really stand out. At what point did the design process do business numbers come into play, how big is the money part of it and influence on design decisions. It’s a big factor, you need to know the budget because it effects where your game will be headed. We start of designing games but end up designing products. *Having some knowledge of business, I know how important it is to consider numbers within the early stage of any project so looking at this in regards to game design my opinion is still the same. You need to budget for your project to see if your idea is doable, if not where can you make alterations to make it doable. If you leave this too late then you will be out of pocket and the quality of the product will be low or otherwise you will have an incomplete game. What is the worst part of the design process? *Trying to see if you have go into too much depth or not gone into enough depth. Self evaluation can be difficult especially when its a game you are making for someone else because your needs entwine with theirs and its important you keep the two separate, unless of course the game is for yourself. For this blog post, I have decided to investigate my target market so that I have enough research in order to begin to understand who I am developing an app for so that it is more effective. I also want to begin to make a decision on what game mechanics I have intensions to apply so that it can be implemented as soon as possible rather then having to backtrack when making my designs. as mentioned in my previous post, I began to look at who I had intended to aim my app at for it to be most effective. Unemployment is sinking, so with this in mind I feel as if my app would meet a reoccurring issue so hopefully it will make a difference for people and help keep people feeling motivated. I thought that because a lot of these people will have spare time, they will most likely be using applications such as Facebook and twitter as it common these days for most people to be using social media. By allowing my app to share to Facebook it gives those individuals who are defined as socialisers to show their progress on Facebook which would also benefit the app as it will gain awareness. For the achievers, having points and rewards are important mechanics to implement. With many individuals owning smartphones, this app would be accessible to many, especially those who are considered more at risk of not getting a job such as young adults who have left college or university in hope of finding work yet struggling to get into the field. I began thinking of how I could keep the user engaged, and I felt as if the best way for me to do this is to use positive and negative reinforcement so I began to look closer at this and began to think of ways that I could implement this within my app. Your characters expression will alter depending on the usage of the app (e.g. if app not used for over 20+ days your character will be sad. If you visit your app every day for a week, the character will show a happy face. This could be used to show an employer that you are committed to finding work? When designing my app I will try to implement these features within my design but this is an on going process so not all of these will be used but each will be trailed to see what works and what doesn’t.